If you like being out in the water then you will love this experience. Not only will you get a chance to be away from the city and in a place that's quiet and relaxing but you will get to fly around in a jetpack on the water. This is the perfect chance to get some excitement and get away from the hustle and bustle and boring city life. You will have a chance to enjoy the warm water while at the same time enjoying a great experience. This is one of the coolest things you are going to be able to do while you're staying Key West. And most importantly you will be able to enjoy the waters and have a good time. 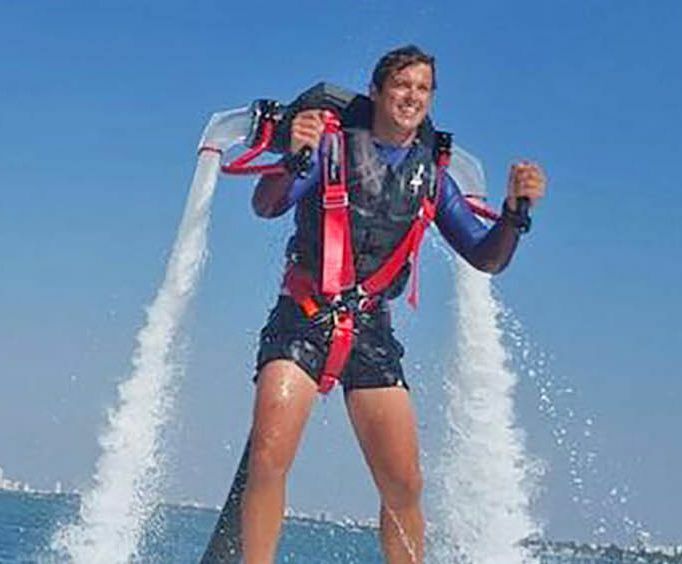 The Jetlev R200 is a personal water-powered jetpack. This is a once-in-a-lifetime opportunity for you and flying this is an amazing experience. You will get an adrenaline-fueled rush as you fly around in the water like you are a superhero. You have the feeling that you are Iron Man or Superman. This is one of the most exciting things you can do and you have a professional instructor every step of the way. You'll be coached on the radio as you instructor teaches you everything you need to control this device and have maximum fun. Once you have shown that you can fly without any assistance then your instructor will let you lose and you'll be able to do whatever you want. Pretty soon you'll be able to fly solo and do whatever you want with a jetpack. This device is also very easy to use and so you will not have a problem controlling it is the ultimate adventure. It's a bird, it's a plane, it's a Jetlev! This is hands-down one of the coolest things to do while you're in port in Key West. No other shore excursion will allow you to fly over the beautiful waters of Key West, with the wind in your hair and adrenaline pumping through your veins, on a Jetlev R200 personal water-powered jetpack. It's a one-of-a-kind experience - the sensation of soaring through the air, taking in the tropical scenery and amazing all whom you pass, will absolutely thrill you. One of Key West's most exciting activities to do while you're in port, the Jetlev R200 lets you do what you've what you've dreamed about since you were a kid - fly! 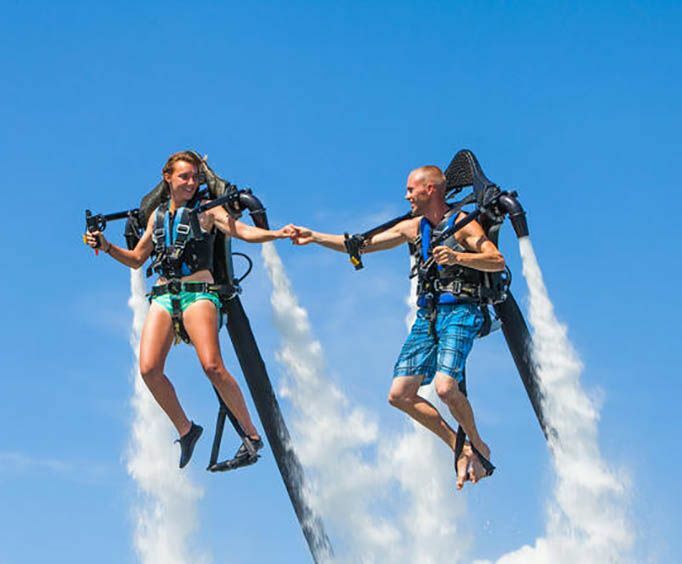 This personal jetpack uses water to push you up in the air, allowing you to soar above Key West's turquoise waters under your own control. It's a shore excursion you'll never forget. A professional instructor will be with you every step of the way, providing direct communication through a waterproof wireless coaching radio and fly-by wire throttle control. Once you have demonstrated balance and control over the jetpack, your instructor will turn control of the throttle over to you. You'll be flying solo in no time! The Jetlev R200's stability, agility and ease of use will astound you. Feel as one with the jetpack when you fly, and experience levitation flight so stable that you will think that you are suspended on cables. The three-dimensional degree of freedom will exhilarate you like nothing else you have ever experienced, yet you can fly over Key West's deep water with the assurance that you are safe and in control. Need some technical details? Unlike conventional aircrafts and jetpacks, the innovative Jetlev concept greatly improves thrust-to-weight ratios by locating the propulsion engine, fuel and related systems on a separate vessel tethered behind the jetpack. It uses water as the jet propulsion medium because its high density can carry vast amounts of power at much lower velocities and generate nozzle reaction forces much more effectively than gases. Most people are able to fly under their own control in 6-8 minutes! Don't miss this out on this incredible water adventure. Please note: This excursion is located within a 10-minute walk to the cruise port so you determine the time you return to your ship in Key West. Please allow yourself ample time to enjoy the excursion and ensure your timely return to the port. This excursion is not covered by our Worry-free policy.